A unique formulation of Food-Grown vitamins, minerals, amino acids and organic beetroot powder to support methylation. We rely on methylation (a naturally-occurring biochemical process) to be constantly producing and removing molecules or substances we do and do not need in the body. This is why methylation is implicated in brain chemistry for many functions including mood, energy, immunity, cardiovascular health, the removal of waste products. Food-Grown are compatible with genetic polymorphisms. With methionine to support the production of cysteine for glutathione and SAMe. With folate and B12 in naturally methylated forms. With beetroot for betaine as a methyl donor. Nutrient enhanced yeast (providing: Methionine, Glycine, Iron, Folic acid, Choline, Vitamin B6, Vitamin B12, Inositol and Riboflavin), Nutrient enhanced Lactobacillus bulgaricus (providing: Magnesium, Zinc, Pantothenic acid), Vegetable cellulose (capsule shell), Organic Beetroot powder. 2 capsules per day with or without food. Dose can be increased if desired. Capsules can be opened and added to any food or drink that is not hot. If you are pregnant, breastfeeding, taking medications or under medical supervision, please consult your healthcare practitioner before taking any food supplement. Food supplements are not to be used as a substitute for a varied, balanced diet and healthy lifestyle. 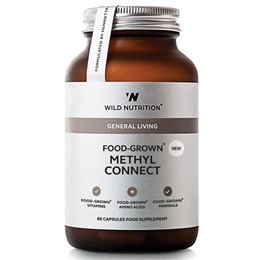 Below are reviews of Wild Nutrition Food-Grown Methyl Connect - 60 Capsules by bodykind customers. If you have tried this product we'd love to hear what you think so please leave a review. A unique formulation of Food-Grown vitamins, minerals, amino acids and organic beetroot powder to support methylation. We rely on methylation to be constantly producing and removing molecules or substances we do and do not need in the body.